On Sunday the 19th of October, I was able to sit in on a class taught by Frank Klausz, one of the woodworking world”s luminary figures. 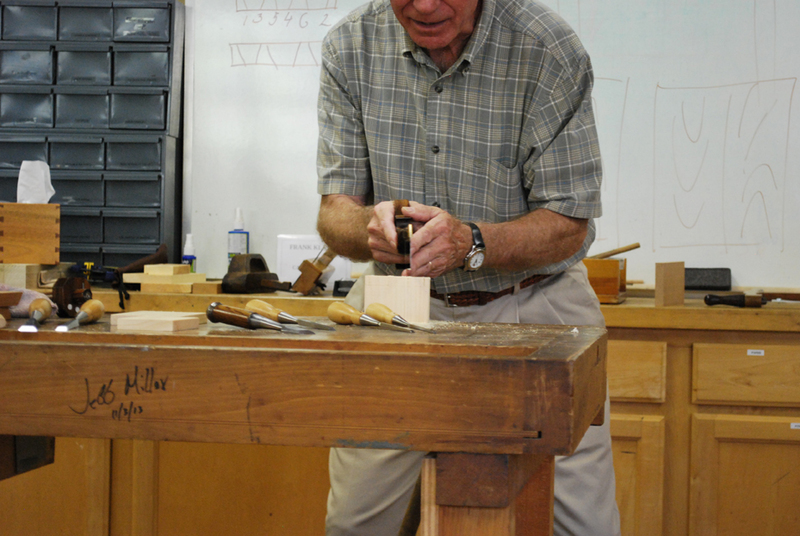 Frank taught a seminar on hand-tool joinery and covered the three major types of dovetails: open, half-lap, and sliding, along with mortise and tenon joints. Frank demonstrated his techniques for cutting the joints, the proper use of each joint, when and where you would use the joint and talked about several other topics. In my life, I have had the opportunity to take some classes from masters of various crafts. As a cellist I was able to attend a class given by Yo-Yo-Ma; as a writer I was able to attend a symposium by several amazing writers. 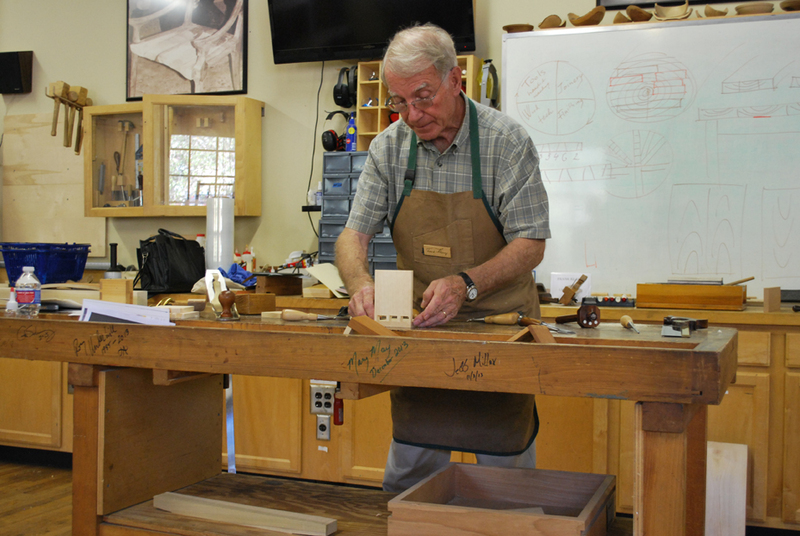 The class given by Frank was no different – it is always a breathtaking experience to watch a true master at work. We started off early on Sunday morning, sitting in the parking lot of Highland Woodworking and eating some breakfast. At around 8:45, the majority of us had arrived and we wandered into the store before class got started. Frank was hard at work already, prepping some stock for his demonstrations and drawing a few diagrams on the white board. At 9:00am Frank welcomed us all to the class and began what has become one of my favorite experiences with woodworking so far. 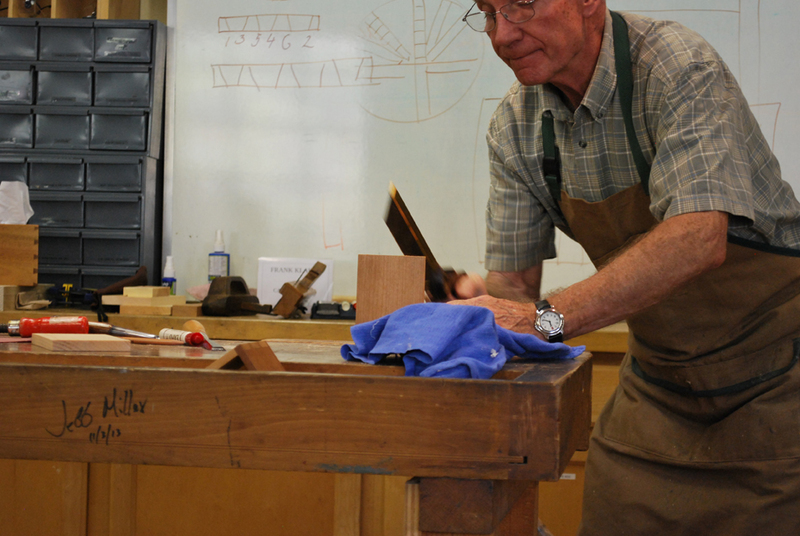 Starting off we discussed the 4 quadrants of woodworking as Frank views them: wood technology, tools, joinery and finish. When Frank talks about wood technology, what he means is to understand the medium you are working in. We all know wood moves, but we have to understand how and why wood behaves the way it does so that we can think about the proper way to lay out a table top and the best way to make a joint. The wood itself is the foundation of our work, and as woodworkers we have to know, to the best of our ability, what that wood is going to do. 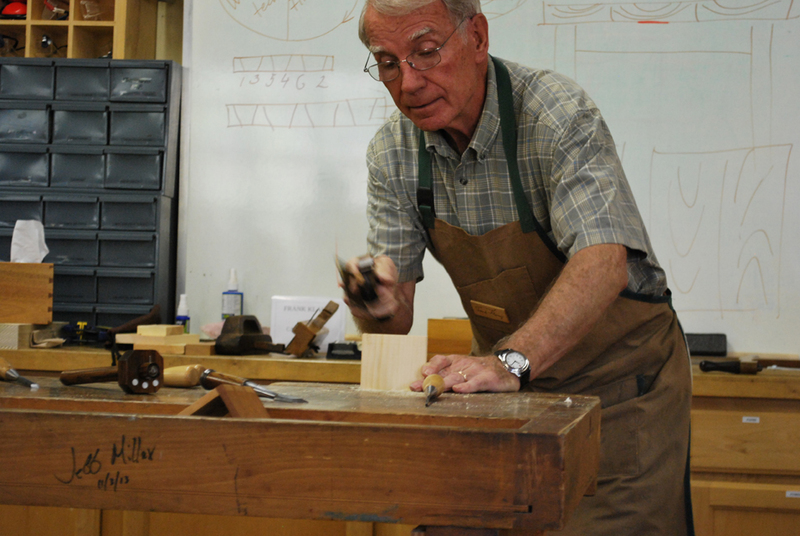 When you purchase a tool like a Lie Nielsen hand plane, or other fine woodworking tool, you are not the owner; you are the custodian of that tool. Tools such as those are heirlooms that you will pass down through the generations, we do not own them, we hold onto them for the woodworkers that will come after us. We went through a demonstration of sharpening as well. Frank illustrated the way he sharpens his plane irons and his chisels. We talked about the various types of stones and grinders that are available and how best to utilize each. 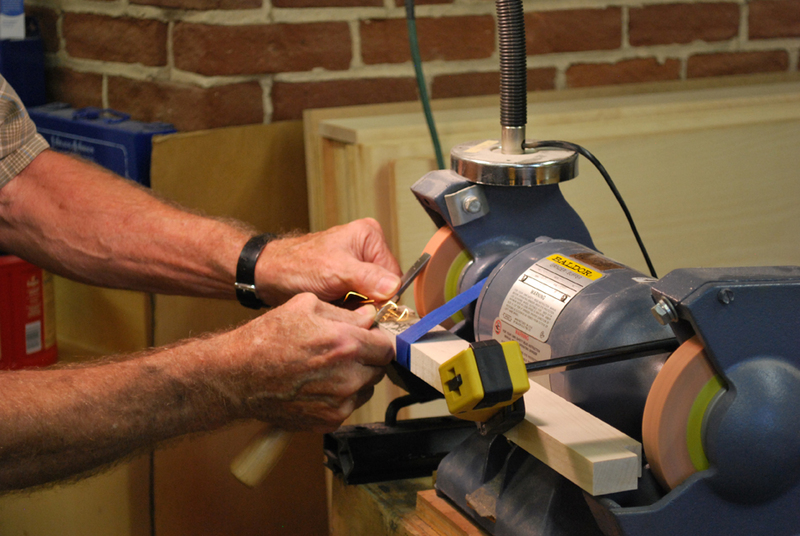 Frank demonstrated that the best jigs you have are your own hands – if you pause and take the time to think about things, to feel the tool in your hands, you often don’t need a special jig. It was brilliant to watch as he took a dull and rounded plane iron from dull to sharp in a matter of minutes. 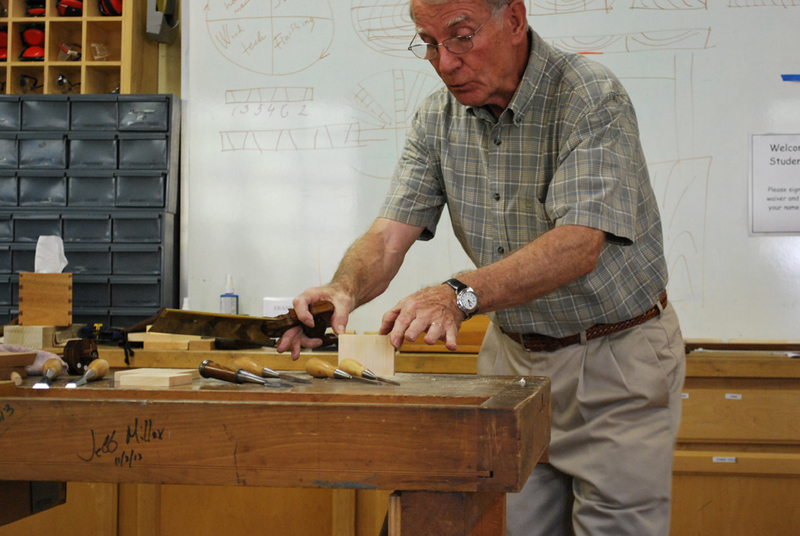 Throughout the class, Frank told stories and anecdotes about his life as a woodworker and life in general. Frank is one of those speakers who often will wander off on a tangent, telling a story about something that has happened in the past, or that seems un-related but they always circle back to the project at hand and the discussion as a whole. 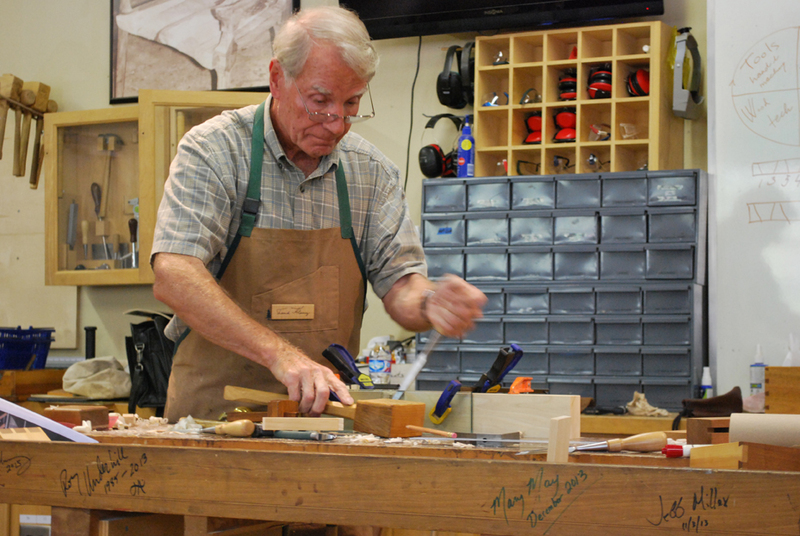 Frank’s stories leave you feeling richer and more enlightened about the world of woodworking. 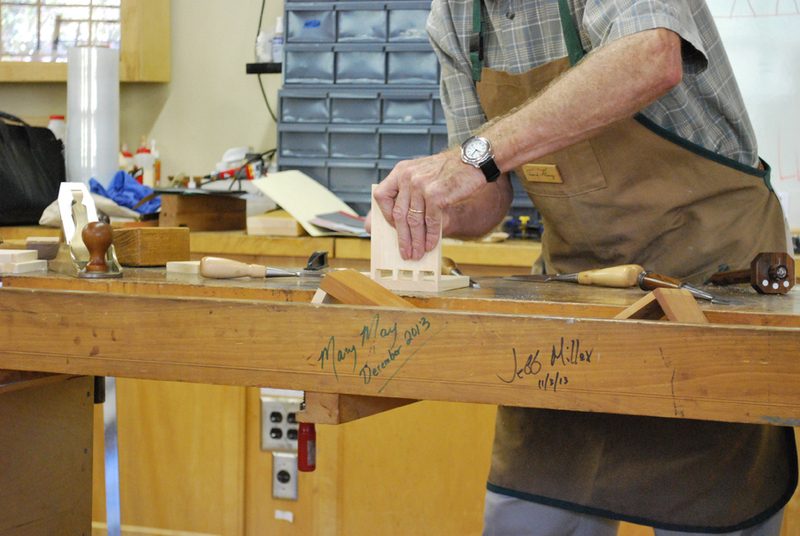 We moved on to the third quadrant of joinery and Frank discussed his thoughts on when to use a joint, and the proper place for joints within a piece. There was a lot of information there, about the differences between reproduction and fine furniture, about Frank’s opinion on when to use which joints, and what it means when you experiment. Frank has some solid opinions, and I got the impression that there is a wrong way to do things, and there is Frank’s way of doing things. When we discussed the fourth quadrant of finishing, Frank made another point that will stick with me as I continue my woodworking journey. The finish is one of the most important parts. Often times as woodworkers we build a piece and then slap a quick finish on it and call it a day. When we spend so much of our time and effort on a piece, we should spend an equal amount of time and effort on the finish. That finish is what defines the piece in the end, and using cheap hardware or a slap-dash finish can take a wonderful piece and ruin it. It reminded me I want to look into the Finishing the Finish class that Highland offers. After the whirlwind tour of Frank’s four woodworking quadrants we moved on to the demonstration portions. 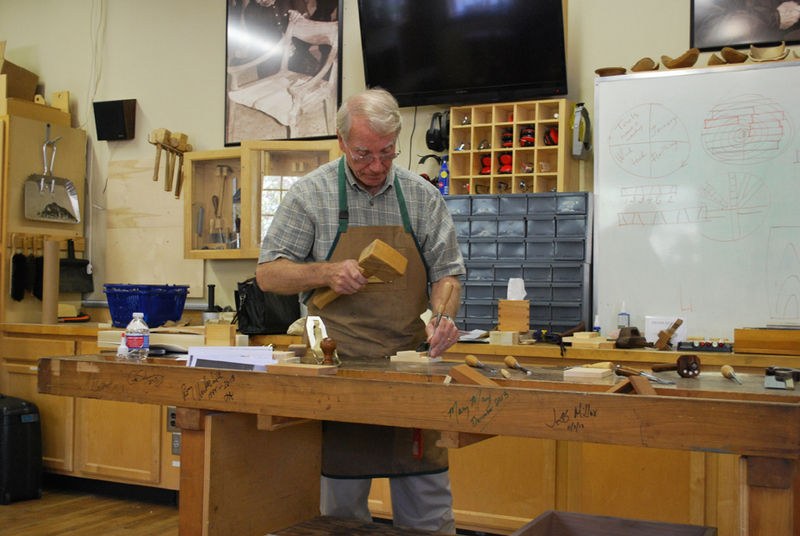 Frank showed us how he cuts dovetails, how he lays them out pins first, and how he uses gravity to help him mark the tails. We then discussed sliding dovetails, how they develop a watertight joint when they are properly made. Frank showed us the box he uses for his honing stones and how, with no sealer or glue, he is able to craft a water-tight box. Once we were done admiring the wooden gasket that Frank demonstrated for us, we moved on to lunch. Let me tell you, one of the great things about classes at Highland is that you can go out to lunch with folks like Frank Klausz, and you get a pretty decent hamburger as well. 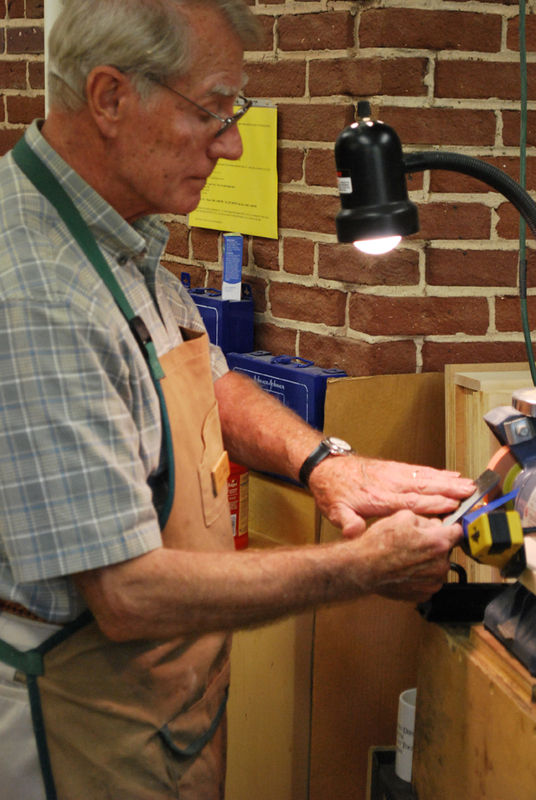 When we returned from lunch we went back over the dovetails for a bit, and Frank gave every member of the class an example of how he cuts them, so that we could take it home and practice. We then moved on to mortise and tenon joints. Frank explained why you need a mortising chisel and why you need to cut your tenons a little shallow, to allow for wood movement. We discussed the advantages of tools like Festool’s Domino Joiner and the applications of domino joints versus traditional hand-cut joints. 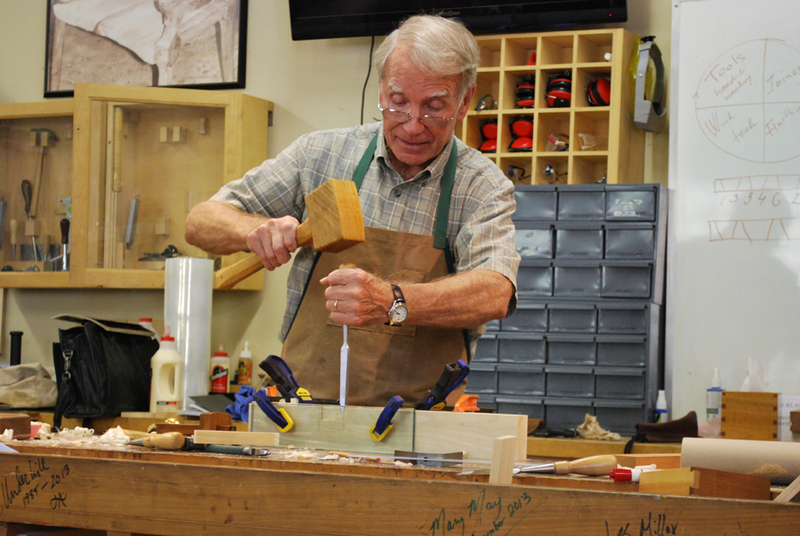 The class ended with more stories and anecdotes from Frank, discussions of life, of the world outside of wood, and of how woodworking impacts all of us. The advice and knowledge I took away from this class made me a better woodworker. It also showed me a path to advance my woodworking and transform the way I do certain things. Not often do you get the opportunity to sit at the feet of a Master, but when you do you take it. I cannot recommend highly enough that you keep an eye on the class listings at Highland Woodworking and that when an opportunity like this presents itself you leap upon it.